Cissy 1959 No. 2115 wears a gold lace with a garland of flowers on her skirt and matching flowers in her hair. Her blouse is emarld green wool jersey accented with a rhinestone starburst pin. Rounding it all out are floral accented gold strap high heels. Cissy has her hands full - being a doll collecting icon has it's responsibilities! Cissy, not only being the mid-century fashion doll extraordinaire, has helped bring so many of us together to share her life and her journey. This journey seems to have no end, as her magic encaptures our imagination and our hearts. 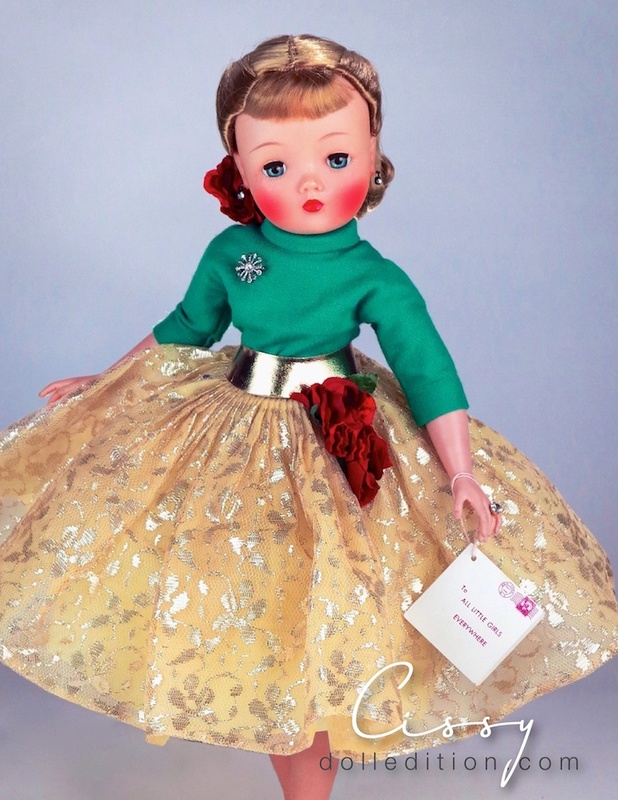 Cissy, gracing the 2014 Holiday Page, is a 1959 No. 2115 gold lace skirt and emerald green jersey, starburst pin and beautiful floral accents. This stunning doll, by Madame Alexander, comes at the end of Cissy's rein over the fashion dolls of a golden era. This was the first year that Cissy would start to receive a new body type, and more slender one piece arms. No one knew it at the time, but Mattel's Barbie, introduced this same year, would rearrange the fashion dolls popularity pecking order. No matter. Cissy collectors are just as crazy-in-love with her as ever! Another feature of the 1959 Cissy was her more enhanced blush and the finer saran now used for her wigs - Barbie may have snuck in to steel the fashion doll crown, but Cissy, bringing on a new level of grangeur, was not done for several more years.